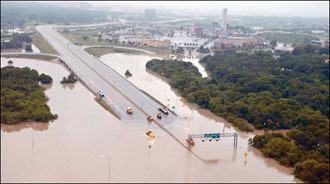 Central Texas and Oklahoma City Resdidents Rely on Broadcasters During Flood | Broadcast Public Service: Local Stations. Big Impact. After years of drought, parts of Texas and Oklahoma experienced historic rainfall that caused flooding, property destruction and power outages. More than 20 people died, as thousands of others evacuated their homes, were stranded in cars or slept in the Toyota Center after a Houston Rockets game. Local radio and television station staff braved the storm to provide lifeline news and weather to the community, raised money for flood relief and encouraged listeners and viewers to support the Red Cross. iHeartMedia’s KASE-FM Austin, TX hosted a concert on June 3 featuring nationally syndicated radio talent Bobby Bones and his Raging Idiots band to raise money for the Central Texas Chapter of the Red Cross. "Bobby’s heart has always been in Austin, where The Bobby Bones Show got its start," said KASE-FM Program Director JT Bosch. "He wants to do anything and everything possible to help his friends and family here in the area rebuild their lives." Sinclair Broadcasting’s CBS affiliate KEYE-TV Austin raised more than $14,000 on May 27 for the American Red Cross of Central Texas. Stations that aired wall-to-wall coverage included Gannett Broadcasting’s CBS affiliate KHOU-TV, CBS Radio’s KILT-AM/FM, iHeartMedia’s KTBZ-FM and KASE-FM Austin, Tyler Media Group’s KJKE-FM Oklahoma City, Cumulus Media’s WBAP-AM Houston and KLIF-AM Dallas, Graham Media’s NBC affiliate KPRC-TV Houston, Tribune Media’s CW affiliate KIAH-TV Houston, and Fox owned-and-operated KRIV-TV Houston. Click here to view video from KHOU-TV. "Radio people get it," KTBZ-FM Program Director Elliot Wood told All Access. "In times like these, they shine. It is a great reminder that radio is an important part of the community."